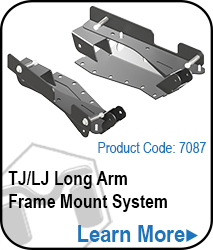 Track bars for long arm TJ/LJ Wrangler suspensions take a beating and the weak press in style bushings many manufactures use wear out quickly. 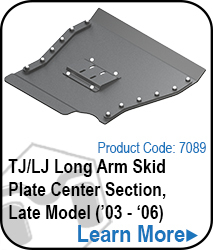 Upgrade your worn out track bar with MetalCloak’s Long Arm RE Upgrade Front Durotrak Track Bar equipped with the patent pending technology of the Durotrak™ bushing that has been specially designed for this application! MetalCloak’s Patented Durotrak™ Bushing (metalcloakpatents.com) installs without the need for a press and the two part bushing threads together and locks into place to create the perfect solution for track bar use. Don’t settle for inferior product that has a history of failure, upgrade your Jeep with MetalCloak’s New Long Arm RE Upgrade Front Durotrak Track Bar. 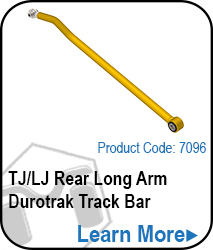 Formed for ultimate Up-Travel & Down-Travel the TJ Wrangler Front Durotrak Track Bar gives strength, ultimate clearance and improved ride stability. 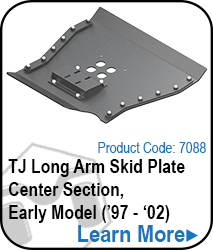 The Front Long Arm Track Bar is equipped with the MetalCloak two part Durotrak bushing for precision movement and refined performance.